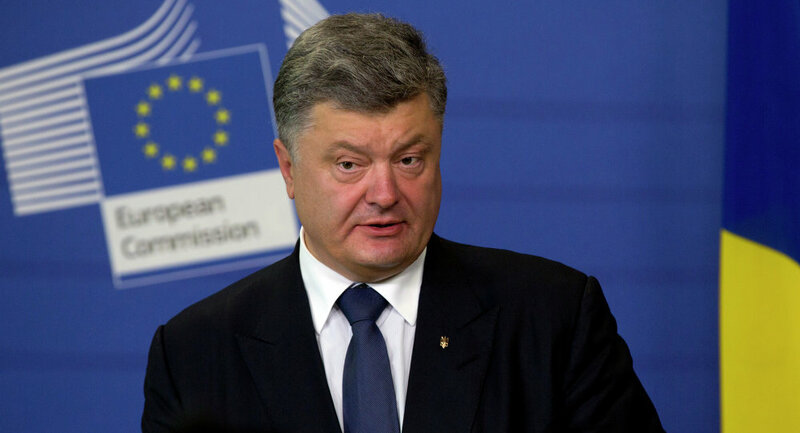 KIEV (Sputnik) — Kiev will not take into account Russia's comments on the participation of Donetsk and Luhansk in the process of amending the Ukrainian Constitution on decentralization, President Petro Poroshenko said Sunday. "We have fulfilled our obligations regarding the start of the constitutional process, although Russia has written notes on 20 pages — it will not happen, we are not going to consider these remarks during constitutional amendment," Poroshenko said in an interview with three local TV channels. The president added that Kiev had conducted all the necessary procedures and was "simply not interested" in the fact that Russia did not like it. "It means the opposite — that what we are doing is the right thing," Poroshenko added. Also Ukrainian leader said that Kiev would appeal to the "international coalition" with the request to expand and extend sanctions against Russia if Ukrainian eastern regions of Donetsk and Lugansk hold independent local elections. "If there are elections, we will negotiate and reach an agreement with the international coalition in support of Ukraine concerning the extension and deepening, expansion and increase of sanctions," Poroshenko stated. Poroshenko mentioned "Plan B" on which he is working. "Plan B is what I am busy working on right now, although I still have hopes and am doing my best to… return Ukrainian territories under Ukraine’s control," the president said. A new ceasefire came into effect on September 1, in a fresh bid to end violence in the southeast of the country. The parties to the conflict last agreed on a truce in Belarusian capital Minsk in mid-February 2015, but both government forces and militias since accused each other of violating the deal.